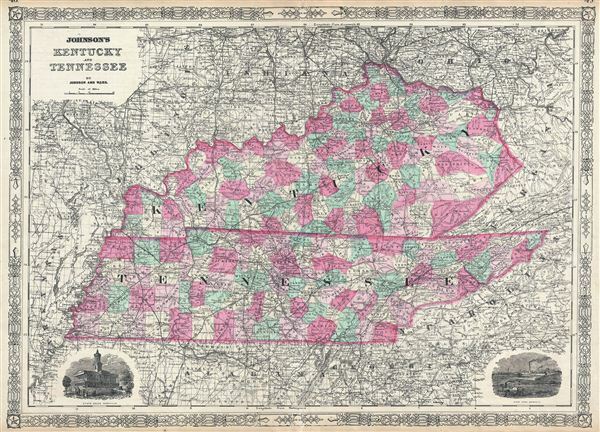 This is a beautiful example of Johnson and Ward's 1865 map of Kentucky and Tennessee. The map covers both states in its entirety along with parts of adjacent states. This rare map offers a fascinating snapshot of these secessionist states shortly following the outbreak of the American Civil War. engraved decorative views of the 'State House Nashville,' the 'Navy Yard Memphis,' feature in the lower left and right quadrant. Various towns, cities, railways, roads, rivers and several other topographical features are noted with relief shown by hachure. It features the fretwork style border common to Johnson's atlas work from 1864 to 1869. Published by A. J. Johnson and Ward as plate nos. 48 and 49 in the 1865 edition of Johnson's New Illustrated Family Atlas. This is the first edition of the Johnson Atlas to be attributed to Johnson exclusively. Very good. Minor wear and verso repair along original centerfold. Minor overall toning. Narrow margins with plate numbers cut off. Rumsey 0535.042. Philips (atlases) 4345.